You don't need to be super flexible or energetic to get involved with and enjoy the benefits of Pilates for seniors in the UAE. Exercise is just as important for seniors. However, some exercise types in the UAE can be too stressful on the body - how does Pilates help? Pilates training in the UAE is seen as a gentle form of exercise when done correctly. This makes it ideal for the elderly because Pilates for seniors can help you stay mobile and also improve your flexibility. Pilates is a well-known fitness and exercise method. For seniors and the elderly in the UAE who are new to ‘Pilates’ can you describe what Pilates is? Pilates is a body conditioning system that improves muscle tone, balance musculature, builds flexibility and muscle strength, as well as increases endurance in the legs, abdominals, arms, hips and back. It puts emphasis on spinal and pelvic alignment, breathing, and developing a strong core or center, and improving coordination and balance. It supports correct posture, and teaches us to move with ease and grace. The Pilates system allows for different exercises to be modified in range of difficulty from beginning to advanced. Intensity can be increased over time as the body conditions and adapts to the exercises. Ideally you should only do Pilates under the supervision of a qualified Pilates personal trainer in the UAE to ensure your posture and alignment is correct. There are many people who can benefit from Pilates but how does Pilates help seniors in Abu Dhabi and Dubai? Pilates is perfect for seniors because it does not have the impact on the body that other forms of exercise do, and is not nearly as severe on the joints as most workouts are. Many of the exercises are performed in reclining or sitting positions, and most are low impact and partially weight bearing. Pilates is so safe, it is used in physical therapy facilities to rehabilitate injuries. Many seniors have mobility problems which is often associated with leading a more sedentary lifestyle. How can Pilates help when it comes to being more mobile and flexible? Pilates instruction begins with an emphasis on control and stability within small ranges of motion to build strength and endurance rather than large and aggressive movements that can cause early fatigue – or even injury. As seniors in the UAE gain control and confidence, they progress to greater ranges of motion that also improve flexibility and ease of movement. Posture, balance, breathing, and core strength are all foundational elements of Pilates. This attention to increased coordination and stability is crucial for seniors as it can help improve functional movement, including balance while standing and walking. Pilates increases strength and flexibility in both the core and the legs, which positively affects balance. It can be challenging to maintain mobility as we age, but being sedentary has so many negative health consequences, such as higher rates of cardiovascular disease, obesity, cancers, diabetes, muscle and bone deterioration, dementia, and depression. The physical benefits of Pilates in Dubai enable seniors to improve and maintain mobility, which in turn helps keep them stronger and in better spirits. Although Pilates is often seen as a more gentle form of exercise in the UAE are there any Pilates exercise routines that should be avoided as we get older? 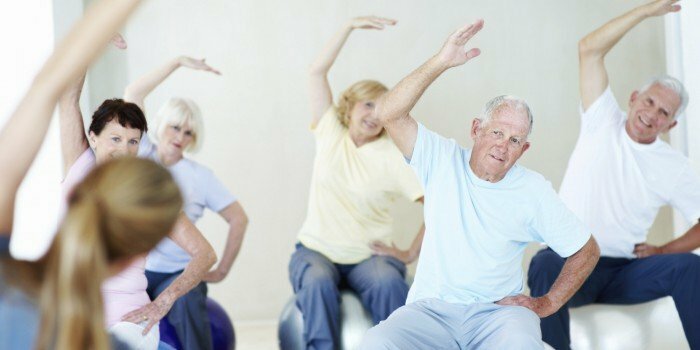 There are no exercises in Pilates that should be avoided as we get older, but defiantly there are exercises that you should not do if you already have conditions that consider as an “age conditions” and you diagnosed with them, such as osteoporosis, sciatica, hip replacement, spondylolisthesis etc. As a personal trainer in Dubai who provides Pilates training do you think Pilates would help seniors with medical conditions such as arthritis – if so how does Pilates help in these cases? Pilates also helps with a variety of age-related ailments. Arthritis sufferers benefit because the gentle mid-range movements decrease the chance of joints compressing while maintaining the range of motion around them. For seniors in the UAE who want to stay flexible and mobile what do you think are the best Pilates exercises for beginners? Ones that will easy people into Pilates gently yet effectively. This exercise is designed to engage your core and lower body, which will help them to build stronger glutes, ultimately improving mobility. The Mermaid is a great movement for seniors because it will lengthen the side and provide inner flow. Side circles can improve hip joint flexibility and improve balance. However, all exercises have to be adopted to exact person, according to her/his fitness level, health condition and performing under control of the Pilates trainer in the UAE. How often would you recommend the elderly in Abu Dhabi and Dubai do Pilates exercises? 3 times a week would be optimal together with walking at least 30 minutes a day.